It's that time of year again (can you believe it? ), when thoughts turn to decorations, gifts, corny t.v. specials - and food! There are so many goodies to be had in the months of October, November, and December, but not all of them are bad. In fact, some might be better for you than you think. No, I'm not talking about the candy or gingerbread cookies (darn it). I'm talking about the stuff that you find next to your turkey. Specifically, sweet potatoes. Let me start off by saying that sweet potatoes and yams are not the same thing. Yes, they are both tubers that look and taste similar, but they are different. What your mom makes and calls candied yams are most likely not really yams but sweet potatoes. Yams can be identified by their almost-black, rough, bumpy skin. Sometimes, a variety of sweet potato (dark-skinned but smooth) is classified in markets as "yams." These so-called yams are sweeter and moister than lighter-skinned sweet potatoes but they are not true yams. It's just as well because true yams are less flavorful and less nutritious than sweet potatoes. Okay, now that we've settled that, let's talk about those orange delicacies that suddenly invade kitchens across the country as soon as the first brown leaf hits the ground. What can possibly be so nutritious about this starchy tuber? You mean, besides the fact that they are fat-free and cholesterol-free, contrary to what you've been taught? That's right, no fat or cholesterol. It's what you do with them that makes them fattening. The butter, cream, gravy, etc.— take away all that and you're left with a heart-healthy product. —Increasing metabolism and the body's ability to release energy from fats and carbohydrates, and reducing fatigue. —Preventing aging and wrinkles (as a side benefit of the first two functions). —Keeping skin and nerves healthy. —Reducing some of the toxic effects of antibiotics and radiation through adrenal support. —Reducing/alleviating symptoms of allergies, headaches, arthritis, psoriasis, insomnia, asthma, infections, neuritis, epilepsy, multiple sclerosis, mental illness, alcoholism, and bruxism (the medical term for grinding one's teeth at night), among other things. Sweet potatoes are loaded with phytochemicals and antioxidants (cancer-fighting agents), particularly beta-carotene, lutein, coumarins, and terpenes. Studies have shown that eating sweet potatoes (among other high-carotenoid foods) every day cuts the risk of heart attacks, strokes, and various cancers significantly. Carotenoids are especially important for fighting lung cancer. The beta-carotene also boosts immunity and prevents cataracts. 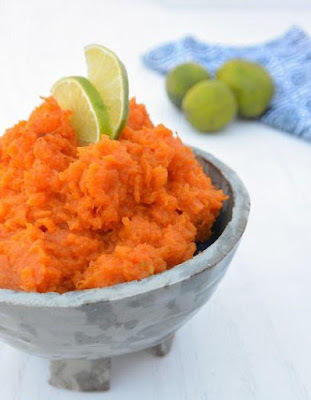 One serving of one-half cup mashed sweet potatoes has 14 mg beta-carotene. I'm sure we've all eaten more than that at our Thanksgiving tables! One medium baked sweet potato contains: 117 calories; 2 g protein; 28 g carbohydrates; 32 mg calcium; 63 mg phosphorus; 0.5 mg iron; 396 mg potassium; 3 g dietary fiber; 2,486 RE vitamin A; 28 mg vitamin C; 8 mg thiamin; 0.15 mg riboflavin; and 0.4 mg niacin. 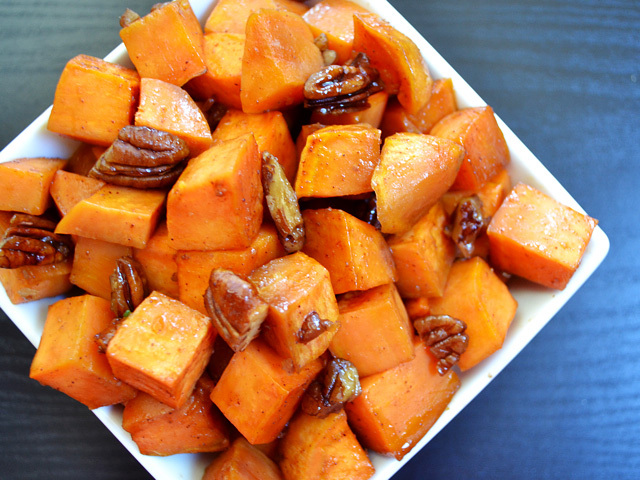 Sweet potatoes are packed with fiber and they are an excellent source of vitamins A and C. For the U.S. 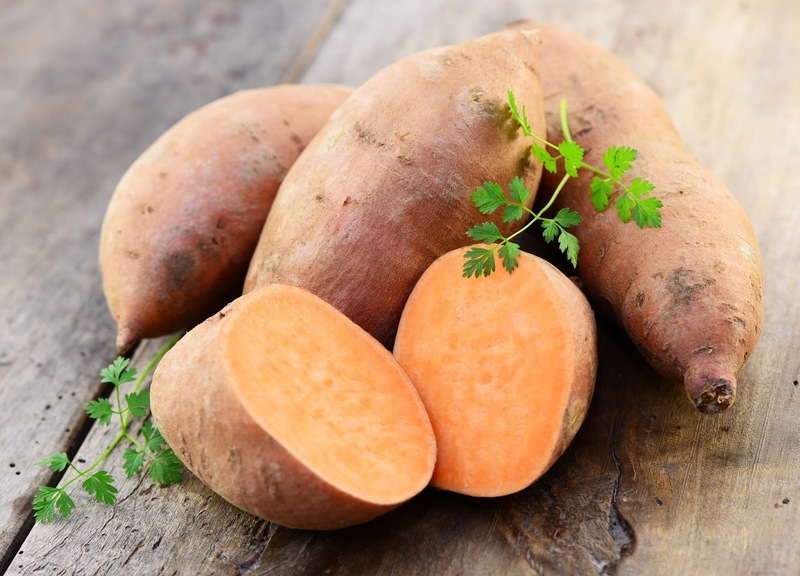 Recommended Daily Allowances, sweet potatoes contain: 520% vitamin A, 2% calcium, 50% vitamin C, and 4% iron. Dark-skinned sweet potatoes have a dark, orange-brownish skin and bright orange flesh. When cooked, they are deliciously sweet and moist. As I said before, these are sometimes classified as "yams" in markets. (Canned "yam" are usually dark-skinned sweet potatoes.) Light-skinned sweet potatoes have pale, yellowish flesh. They are drier and not as moist as the darker ones. They are also less sweet and flavorful. These can be preferable, depending on the dish you're making and the texture you are going for. Whatever type you choose, pick firm potatoes that are smooth and unbruised. Avoid sweet potatoes with moldy ends, cracks, or ones which have been sliced off at the ends. Store them in a cool, dark area - but not the refrigerator. Vegetable bins or baskets are ideal. Use them within a couple of weeks. Finally, I'd like to say that Americans do a great disservice to the sweet potato if the only way they make it is plopped out of a can and baked with marshmallows on top, and only on Thanksgiving Day. There are so many different ways to make sweet potatoes. Simply baking them whole is enough. They don't even need butter or any type of seasonings; they are sweet and delicious all on their own. But, since variety is the spice of life, do try them other ways. Below are some recipes for you. Have a wonderful Thanksgiving, everyone. And try to remember the things you have to be thankful for, whether it's your health, the love of your family and friends, or your ability to enjoy great food. 1. Preheat oven to 400 degrees (205 degrees C). 2. In a large bowl, combine the sweet potatoes, honey, ginger, oil, cardamom and pepper. Transfer to a large cast iron frying pan. Bake for 20 minutes. 3. Turn the mixture over to expose the pieces from the bottom of the pan. Bake for another 20 minutes, or until the sweet potatoes are tender and caramelized on the outside. Prick sweet potatoes and roast on a foil-lined baking sheet in middle of oven 1 hour, or until very soft. Cool potatoes just until they can be handled and scoop flesh into a food processor. Purée potatoes until smooth. Add lime juice and salt to taste and purée mixture until combined well. Sweet potato purée may be made 2 days ahead and chilled, its surface covered with plastic wrap. Peel and thinly slice the potatoes and apples. Combine the orange preserve and juice together. Arrange the potatoes and apples in a baking dish. Pour orange mixture over potatoes and apples and cover with a lid or foil. Bake for 45 minutes at 350 degrees. They are done when potatoes are easily pierced with a fork.